Blade length : 34.2 cm or 13.46inches. Width at the hamachi : 3.15cm or1.24 inches. Kasane : 0.71 cm or 0.28inches. Shape : The blade is Hirauchi style sunnobi Tanto. Jigane :Koitame hada well grained with jinie attach beautiful Muji style Jigane. Hamon :Nioi deki suguha from the hamachi and then cyoji midare hamon with ashi, Yo．Boshi is round shape. Special feature: Yokoyama Sukekane was a swordsmith of Bizen province. He was an adopted son or a pupil of Yokoyama Sukenori. This katana is a revival of old Bizen style. that he was a descendant of Tomonari. From the excellent workmanship, it is entirely convincing. master-swordsmiths in the Japanese sword world. Saya : Brown color Ishime-Ji Saya. and gold color family crest. Menuki : Shakudo, butterfly is engraved with gold color. Kashira: lobster is engraved with gold color. 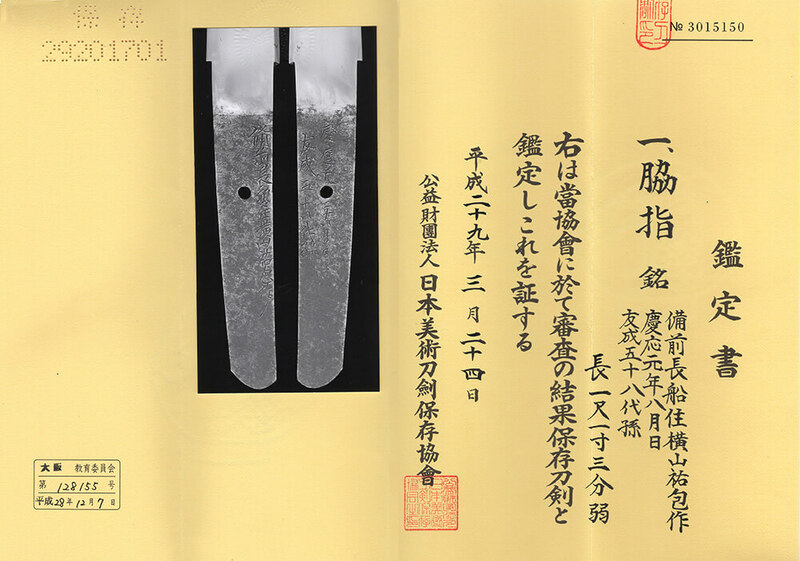 From Aoi Art:At the end of Edo period, many sword makers were making Nioideki Cyuji midare hamon. Yokoyama Cyoji midare hamon, his student Sukakane made a lot of this type of Hamon and also educated many student and asked to make this Cyoji midare hamon. So his stdent like Sukeyoshi, suketoshi Sukenao are making this kind of hamon. It is very easy to distinguish his or his family’s hamon. This blade is healthy typical Sukekane hamon.